Water scarcity already affects every continent. Around 1.2 billion people, or almost one-fifth of the world's population, live in areas of physical scarcity, and 500 million people are approaching this situation. Another 1.6 billion people, or almost one quarter of the world's population, face economic water shortage (where countries lack the necessary infrastructure to take water from rivers and aquifers), estimates UN. Water scarcity is among the main problems to be faced by many societies and the World in the 21st century. Water use has been growing at more than twice the rate of population increase in the last century, and, although there is no global water scarcity as such, an increasing number of regions are chronically short of water. For decades, a lot of work has been done to establish water supply projects, yet it still remains a major challenge to build long-term sustainability in this region. In most communities, people could go to central spigots and pay a fee for access to groundwater that's both drinkable and readily available. The Grundfos Lifelink team had initiated a social campaign of providing the sustainable water distribution in this region. They established the first demonstration projects in Kenya in 2009 to test the ground-breaking technology and concept of Grundfos Lifelink. Since then, 40 demonstration projects have been implemented, providing access to water for nearly 100,000 people. To solve the problem of dispensing water while also creating revenue for the local community, the company developed AQtap. It's a machine that essentially functions like an ATM for water: users get a "water card" where they can collect points, either by making a purchase from a vendor or making a payment on their phone. When they swipe their card at the machine, a simple interface will allow them to select the amount of water they want and then deduct the points from their card. A hose below the screen dispenses the selected amount of clean water. 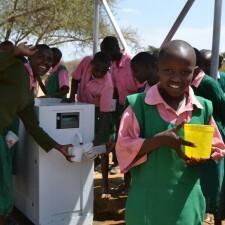 Grundfos AQtap is an intelligent water dispenser that addresses some of the main challenges of providing reliable and sustainable water supply in the developing world. Through an integrated platform for revenue collection and online management of water kiosks, Grundfos AQtap supports the financial viability and accountability of water service operations. The AQtap machines look just like a typical ATM, with a steel cabinet and a touch interface. "The physical design is characterized by robustments—we know that these will be in tough environments," says Lorenazen. A blue water drop indicates where to slide in the blue water card, making it very intuitive for users who might not read or haven't used an ATM before. The project is still in its pilot stage, but being tested in Kenya, Uganda, Thailand and Nigeria. In the slums of Nairobi, where the company has worked with the local government to set up four ATMs, community members pay 3 Kenyan shillings ($0.20 USD) for a 20-liter jerry can of water.